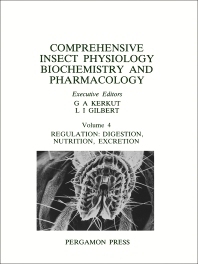 In this volume, seven of the chapters deal with feeding and diet, which is reasonable since insects consume an estimated l5-20% of all the world's planted crops. Many insects even have a specialized larval feeding stage that usually occupies a different ecological niche to the adult and so does not compete for the adult's food stock. Other chapters describe the means by which insects maintain their water balance, nitrogen balance and temperature balance under a range of conditions. These involve regulation by hormonal and behavioural systems that are also described here. The l4 chapters are all extensively illustrated and referenced and therefore provide excellent summaries of current knowledge. They will be of great value to entomologists, zoologists and biologists in general. Regulation of feeding behaviour, A E Bernays. Feeding mechanisms, J J B Smith. Food consumption and utilization, F Slansky Jr & J M Scriber. Structure of the digestive system, R F Chapman. Coordination of digestion, R F Chapman. Nutrition: organisms, R H Dadd. Absorption, S Turunen. Biochemistry of digestion, S W Applebaum. Nutrition: artificial diets, J P Reinecke. The excretory system: structure and physiology, T J Bradley. Nitrogenous excretion, D G Cochran. Thermoregulation, M L May. Biochemistry of insect luminescence, W D McElroy & M DeLuca. Water balance of insects, G W Wharton. Species index. Author index. Subject index.